Fourth Sunday after Epiphany — Latin Liturgy Association, Inc. COLLECT O God, who knowest us to be set in the midst of so great perils, that because of the frailty of our nature we cannot stand; grant to us health of mind and body, that those things which we suffer for our sins, we may by Thy aid overcome. Through the same Jesus Christ, our Lord &c.
EPISTLE (Romans XIII. 8-10.) Brethren, owe no man anything, but to love one another; for he that loveth his neighbor hath fulfilled the law. For thou shaft not commit adultery; thou shaft not kill; thou shaft not steal; thou shaft not bear false witness; thou shaft not covet; and if there be any other commandment, it is comprised in this word: Thou shaft love thy neighbor as thyself. The love of our neighbor worketh no evil. Love, therefore, is the fulfilling of the law. What is meant by St Paul’s words: He that loveth his neighbor, hath fulfilled the law? GOSPEL (Matt. VIII 23-27) At that time, when Jesus entered into the boat, his disciples followed him. And behold, a great tempest arose in the sea, so that the boat was covered with waves; but he was asleep. And they came to him and awaked him, saying: Lord, save us, we perish. And Jesus saith to them Why are ye fearful, O ye of little faith? Then rising up, he commanded the winds and the sea, and there came a great calm. But the men wondered, saying: What manner of man is this, for the winds and the sea obey him? Why did Christ sleep in the boat? Why did Christ reproach His disciples when they awaked Him and asked for help? Because of their little faith and trust; for if they firmly believed Him to be true God, they would necessarily believe He could aid them sleeping as well as waking. Why did Jesus stand up and command the sea to be still? To show His readiness to aid us, and His omnipotence to which all things are subject. His disciples who saw this miracle, wondered and said: What manner of man is this, for the winds and the sea obey Him? We see daily in all creatures the wonders of the Omnipotence, the wisdom, and the goodness of God, and yet we are not touched; we continue cold and indifferent. The reason is, that we look upon all with the eyes of the body and not with the eyes of the soul; that is, we do not seek to ascend by meditation to the Creator, and to judge from the manifold beauty and usefulness of created things the goodness and the wisdom of God. The saints rejoiced in all the works of the Lord; a flower, a little worm of the earth would move the heart of St. Francis of Sales, and St. Francis the Seraph, to wonderment and to the love of God; they ascended, as on a ladder, from the contemplation of creatures to Him who gives to every thing life, motion, and existence. If we were to follow their example, we would certainly love God more, and more ardently desire Him; if we do not, we live like irrational men, we who were created only to know and to love God. ASPIRATION Grant us, O good Jesus! 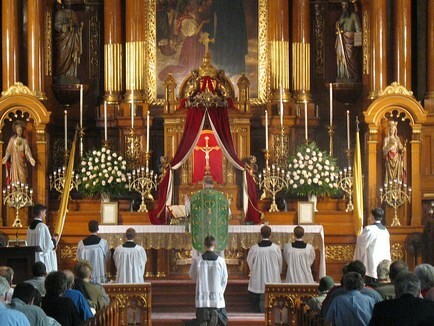 in all our needs, a great confidence in Thy divine assistance, and do not allow us to become faint-hearted; let Thy assistance come to us in the many dangers to which we are exposed; command the turbulent winds and waves of persecution to be still, and give peace and calmness to Thy Church, which Thou hast redeemed with Thy precious blood, that we may serve Thee in sanctity and justice, and arrive safely at the desired haven of eternal happiness. Amen. If we once believe that God created the world, (and what rational man can doubt it?) then we must also believe He rules and sustains it. Can any work of art, however well constructed and arranged, subsist without some one to take charge of and watch aver the same? Would not the greatest of all master-pieces, the world, therefore come to the greatest confusion and fall back into its original nothingness, if God, who created it from nothing, did not take care of its further order and existence? It is indeed true that the method of Divine Providence with which God controls all things is so mysterious that, when considering some events, one is persuaded to admit a necessary fate, an accident, the course of nature, the ill will of the devil or man, as the fundamental cause. Yet in all this the providence of God is not denied, for nothing does or can happen accidentally, not the smallest thing occurs without the knowledge, permission, or direction of God. Not one sparrow shall fall on the ground without your Father. But the very hairs of your head are all numbered. (Matt. X. 29. 30.) Chance, fate, and luck are but the ideas of insane or wicked men, which even the more rational heathens have rejected, and the course of nature is but the constant, uninterrupted, all-wise and bountiful preservation and government of creation through God. The perverted will of men or of the devil is but the instrument which God in His all-wise intention, uses to effect the good, for He knows how to produce good from evil, and, therefore, as St. Augustine says, “permits the evil that the good may not be left undone.” If we peruse the history of our first parents, of Abraham, of Joseph in Egypt, of Moses, of the people of Israel, of Job, Ruth, David, Tobias, Esther, Judith and others, we will easily see everywhere the plainest signs of the wisest Providence, the best and most careful, absolute power, by virtue of which God knows how to direct all things according to His desire, and for the good of His chosen ones. The gospel of this day furnishes us an instance of this? Why did Christ go into the boat? Why did a storm arise? Why was He asleep? Did all this occur by accident? No, it came about designedly by the ordinance of Christ that His omnipotence might be seen, and the faith and confidence of His disciples be strengthened.